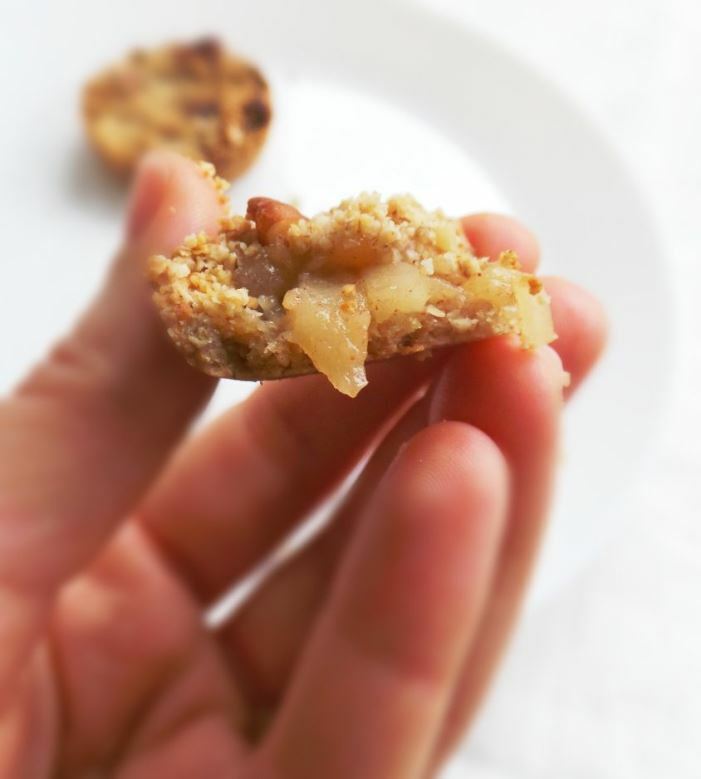 Mini apple crumble pies with no sugar and no flour! Sounds mouth-watering…but it actually really is. 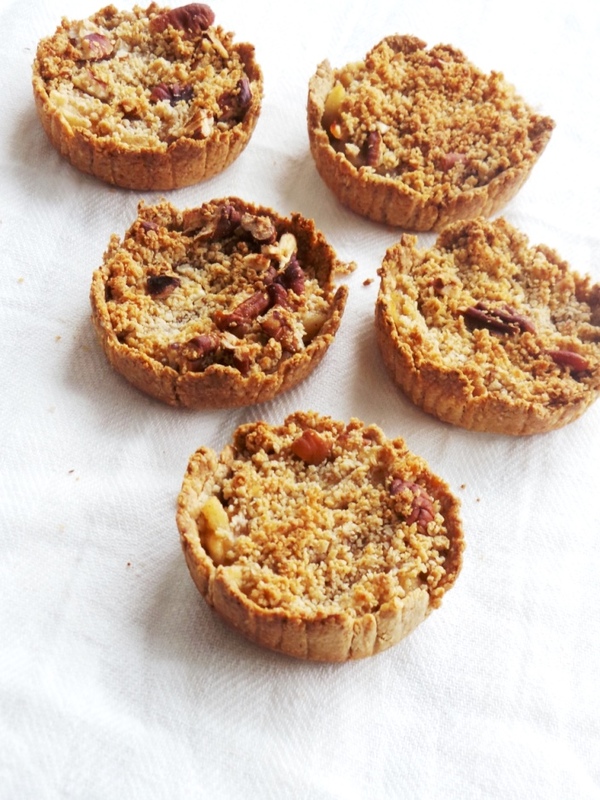 And this time I made these adorable healthy, high-fiber apple crumble mini pies. Actually they’re amazing. I’m slowly starting to think I can bake. Gone are the days when everything I baked tasted like old stinky socks. The pictures don’t show it, because it was late when I took them so I didn’t have much natural light, but these apple crumble cups are sooo delicious, oh my goodness. 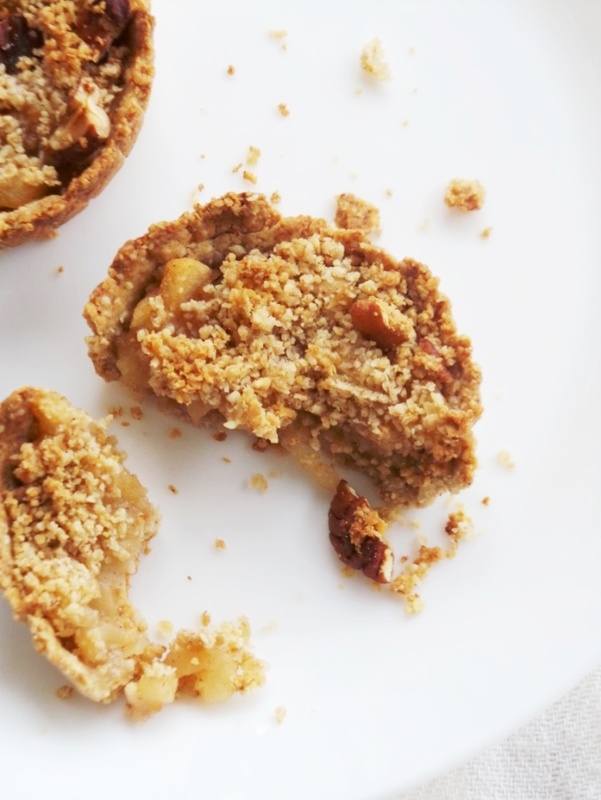 I want to make these apple crumble cups every single day for the rest of my LIFE. And if I had one hour for that daily – trust me I would do it. And I would feel good about it, because aside from tasting absolutely divine, these are super healthy. There’s not even one ingredient that is bad for you or too fancy for me. All just whole foods (aside from coconut oil) we all have at home. 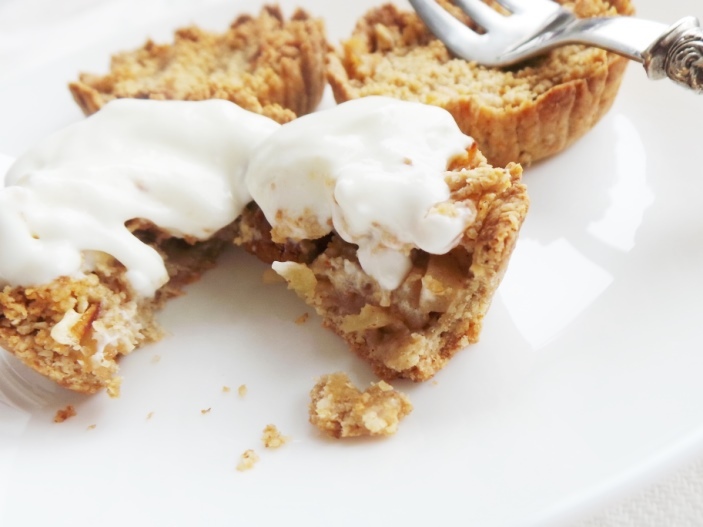 How did these apple crumble pies get so healthy? Add a few more healthy ingredients, put everything in the oven, take it out and start a new life in a little place called taste bud heaven. Incredibly delicate, super crumbly, buttery and perfectly sweet. And yet this is a dessert I never thought I’d make. Hating apples doesn’t mean I’m a bad person… I just want to marry a doctor. Apples have bad reputation, you know? Snow White chocked on an apple and almost died. Eat an apple and you might die from chocking. Eat an apple and you’ll get spit on and sued by a snake. However, one bite of these yummy apple crumble mini pies and I forgot all these horrifying facts. I also forgot about my apple allergy (which is a real thing – but only for raw apples). The one thing that put me in a little bit of pain while making these apple crumble cups was spreading that dough in the muffin forms. That took a while.Totally worth it, but just a little heads up! You’ll need some radio on, patience and time. You can also try making the crumbles in a small springform cake tin – this will definitely save you some time. 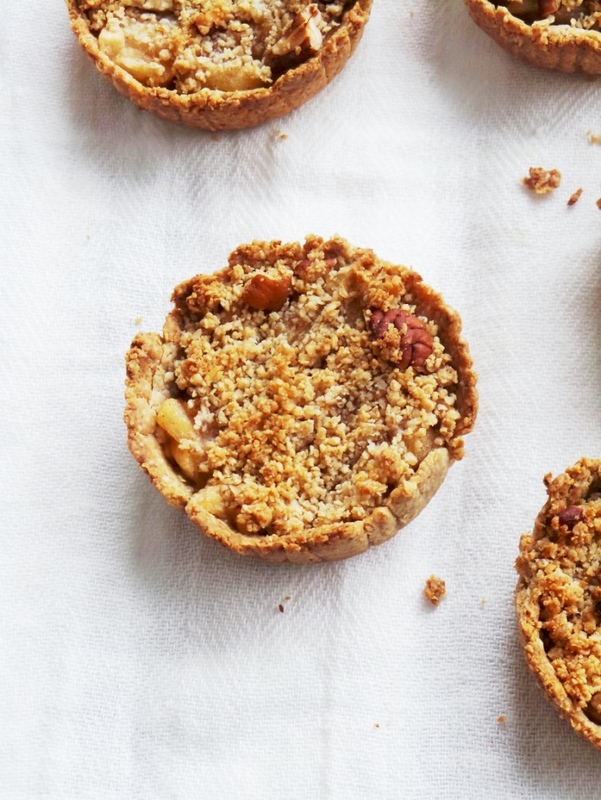 This way you will have one small crumble pie and not 9 adorable apple crumble mini pies. I liked the idea of mini pies as they are the perfect portion size, have no chance of falling apart and look cute. In case you use the springform cake tin for this recipe, you might need a little more filling, but a 3rd apple should do it. The only “special” ingredient you might not have at home for this recipe is oat flour, but you can easily make it yourself. You simply grind oats in your food processor or your coffee grinder if you don’t have a food processor. 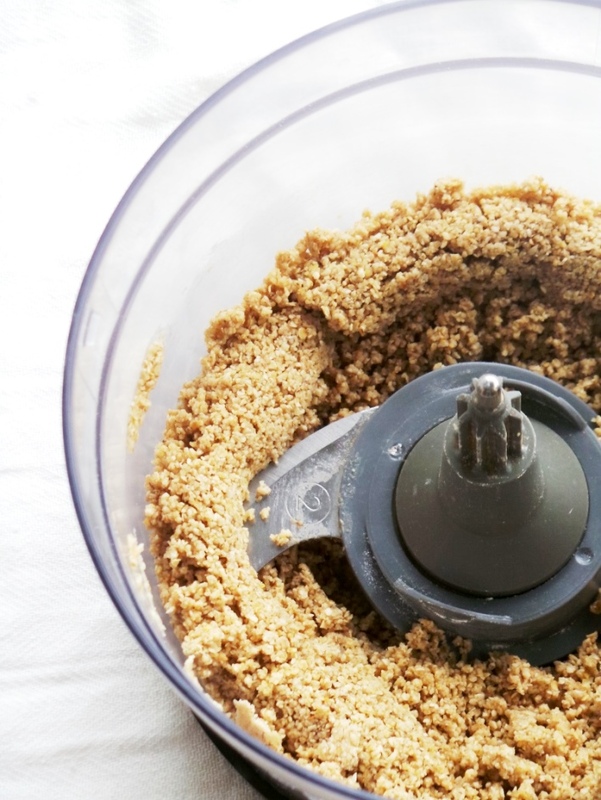 I tried this with my mom’s 30-year old coffee grinder and it works perfectly – you can grind nuts, oats, everything in it – place, pulse and ready. 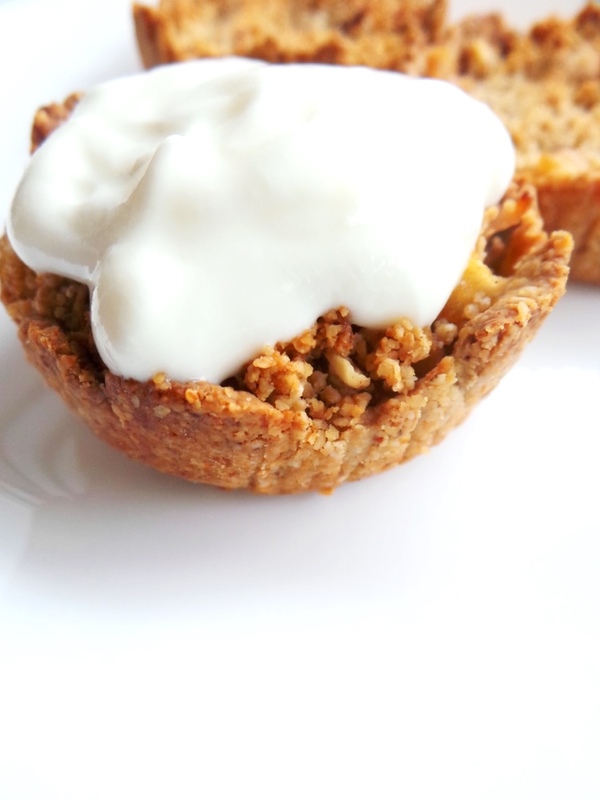 Delicious apple crumble mini pies that are surprisingly healthy - have them for breakfast or as dessert! In your food processor combine all ingredients for the crust aside from water – ground oats, coconut oil and honey and pulse until crumbly. Take 2 Tbps of the crumble and set aside in a bowl for the topping later. Add water 1 tbsp at a time to the rest of the mixture in your food processor. Then pulse again. The crumble should become a little less crumbly and should be able to stick together, but still crumble a little. Line a muffin tin with 9 muffin baking cups. You’ll need 2 Tbsp of crust mix per cup. Press that mixture starting from the middle of the cup and work your way up, pressing so that the cups are half-full (hey, we’re optimists here!). Press the crust well, it should start looking like the crust for a cheesecake or a tartelette. Once done with the crust (FINALLY), sauté the apples in a small non-stick pan for 3-5 minutes with 1 tbps coconut oil and cinnamon. Let cool off for 5-10 minutes. Fill the crumble cups with the sautéed apples - it takes approximately 1 Tbsp per cup + some. Start by adding 1 Tbsp per cup and then add more. Now let’s make the topping. That’s easy, remember the 2 Tbsp crust mix you set aside. Take it, chop some pecans and throw them into the same bowl, mix together. Then place mixture on top of the apples. Bake at 180°C/350 °F for about 25-30 minutes. Let cool off a little (don’t want you to burn your tongue with the apple filling) and then eat. These mini pies are best when they’re warm, so even the next day – warm them up a little bit. Also top with some yogurt or for the vegan version with whipped coconut cream. It’s important to use sweet apples for this crumble, since we’re only using 1 Tbsp honey or maple syrup if you’re vegan. PS: I used a very similar crust for these mini cheesecakes with cottage cheese if you want to check them out. This apple crumble smells incredible, but please be careful when you make it to not bite into it while it’s still super hot! Guess who did that? Do you think I could add fresh cranberries to this? Confused about 1,5 cups of oats. Does this mean 1.5 meaning 1 and a half?? Also would this work using silicone cupcake pan instead of using liners?